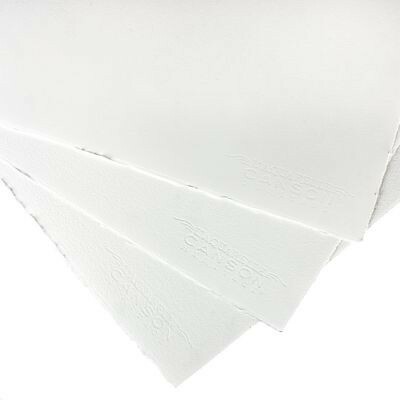 For centuries the world's greatest artists have expressed themselves using Canson® papers. From the moment it was founded, Canson® has created artist papers that meet the most exacting quality standards, combining the savoir-faire of handcraftsmanship with innovative technologies. The proof can be seen in L’Aquarelle Canson® Héritage, born of our intimate history with the artists of yesterday and tomorrow. This 100% cotton paper of traditional composition is mould-made using time honored paper making methods, giving it a unique sensory impression, a texture that is sensual to the touch, worthy of the finest “ handmade ” papers. Its innovative design allows for uniform washes. Capture vibrant and true-to-life colours, incredibly crisp rendering, all while ensuring brightness (wet or dry). Mould-made using the technique closest to that of handcrafted paper, L’Aquarelle Canson® Héritage is now part of the very exclusive circle of papers with incomparable textures purists can distinguish from a thousand others. This unparalleled paper has many unique qualities.